Thanks for your help, I've had a look in that file and this is what it says (see picture), I'm not sure what further action to take. remove the leading # on that line and the next one, save the file (you will need admin privs). Okay I've managed to remove the two # from the last two lines, but this is my current situation, do I need to change the modified one (the text document) into a normal file or something? Be-care with hosts file too. It's worked, thank you so much! Download spyware blaster from here you use the free one. That will help protect the host. What are you using for protection. Run both in safe mode. Tell me what are you results from each? Thanks for the response, I'm having to use my tablet because the internet on my laptop isn't working, how can I download it onto my laptop without internet? Which tablet are you using iPad, Android or Windows? You never said. Do you have Box.com, Dropbox or SkyDrive? You could download to those cloud storage and then slide load the files to the laptop. What do you see when you type yours. Another thing we can do for you is make you use static IP address instead of doing a DHCP. This way you would force the PC in question to use a certain address. I'm using an android tablet, but I don't think I'll be able to pull off the downloading on my tablet and using my skydrive etc. I don't know much about it because I never use them. Why are you using IPV6 with IPV4. You should really use one. I use IPV4 on Windows systems here. On the Android tablet go to play store and download: WiFi Analyzer This below is WiFi Fixer but you don't need that for your Android tablet. Okay your on IPV6 but there is no default gateway showing up. 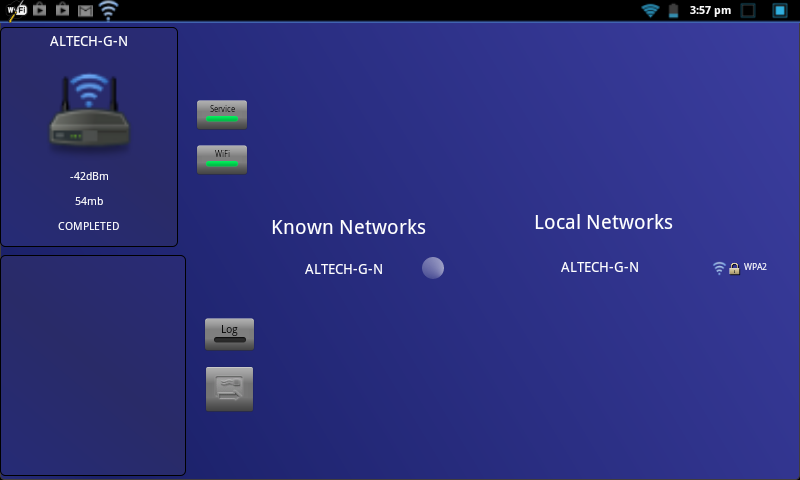 You need to go into the NIC configuration for your computer and change the default gateway to match your router IP address. That needs to be in there. It's missing. Why are you on IPV6 though? Is the tablet setup to use IPV6? Also appears that you have BOTH a wired and a WiFi connection and that will mess up the routing table. OP is running VMware on PC then says they're having issues. If it was working then what's changed. Yes you need to disable WiFi or Wired connections you can't run both setups there was a time you could but in your case you have VMware on the hardwired connections. It clearly shows that's what you have. IP for that is completely different for your WiFi. So if you using WiFi disable the VMware connection. Or whoever is running VMware on that system. I wasn't aware that I was using IPV6 and IPV4, I'm not even sure what they are or what they mean. I'm also not sure what IPV my tablet is setup with. I never use an ethernet cable with my wifi so I don't know why it would appear so anyway, this is the result from the wifi analyser.. View attachment 76769 . How do I disable the VMware connection so I can use the WiFi? To get to the Open Network sharing center you should see either ||||| near the clock in the system tray or you see monitor with power line cord. Right click on these will give you the option to get too the Network and Sharing Center. Thanks, but which one am I disabling? Eek! Disable all of those and only keep the WiFi enabled. Is this a work PC or did you buy it like this. If your not using VMware you can remove those. Should only have Ethernet and WiFi. You'll need to go into the System Device Manager and see what you have for Networking. Those VMware would need to be removed. But before you do that make sure you don't have any VMware software installed. I bought it like this, I only bought it in April so I don't know why everything is going wrong with it so soon I've disabled them, I don't know if the internet is supposed to be working at this point, but it's not. I've searched for VMware software on my laptop and found 'VMware player', not sure what that's all about? Well is the laptop or desktop running okay now with the internet? That's the VMware Player allows you to run multi-OS on your system. If your not going to use it can remove it. If you plan on using it leave on their. That's up to you. I see you disable what I had mentioned! Good Job!